I break my Pixar boycott and go see Brave. Reluctantly, I find it bearably good. Whenever anyone mentions Pixar, my good friends roll their eyes, because I’m about to launch into an monologue that they’ve all heard dozens of times: I hate Pixar. I haven’t always hated Pixar, but they haven’t made a great movie since 2004’s The Incredibles (although there’s an argument to be made for Cars). They do this on purpose. They want you to feel strong, powerful emotions so when you exit the movie you’ll think to yourself “Man, what a great movie! I cried four times! 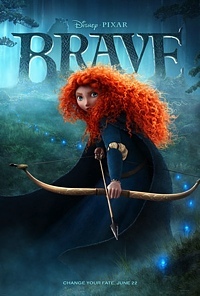 I will buy all of the merchandise!” But, just because a film has you tearing up doesn’t make it great.2 And Brave isn’t a great movie; it’s a bearably good one, thankfully missing the fingerprints of the corporate suits and their sadlists. Brave is mostly a story about mothers and daughters, somewhere between Freaky Friday and Mommie Dearest, set in the lovely Scottish moors. I just looked up “moors” and it turns out I mean “crags!” Anyway, sixteen-year-old Princess Merida loves to shoot things with arrows but her mother would prefer she didn’t. Actually, her mother would rather Merida not do most of the things she loves doing,3 and instead focus on becoming a better princess. Because as we all know, you gotta be a good princess to get a good man! So the neighboring clans send over their closest approximations of good men to compete for Merida’s hand in marriage–in a manner of her choosing. 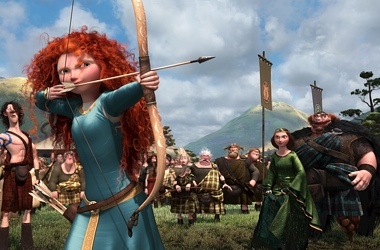 Because she’s kind of a badass, Merida chooses archery and decides to compete for her own damn hand! It’s pretty great. Unfortunately for the princess, after Robin Hooding the competition, the queen is none too happy. Merida does what most movie teenagers would do in her situation: ask a witch to change her life. And crazily, the witch’s spell, while technically working does so in an unexpected way! Who’d a thunk! Even though the plot is predictable, the characters are lovely. Brave is a case study in why Scottish people are better than us, with their charming lilting accents. Merida (Kelly Macdonald, No Country for Old Men) is sprightly, and the graphical horsepower devoted to her bright red hair alone is impressive.4 Plus Pixar has absolutely nailed animating the “annoyed face teenagers make at their mothers.” Her father, King Fergus of DunBroch (Billy Connolly, The Boondock Saints), is a large, grizzly man who you may think is played by John Cleese, but then you’ll remember that Billy Connolly is the Scottish John Cleese. Merida’s younger brothers (triplets) win fan favorite, hands down. However, here’s the truth: How to Train Your Dragon better executes the same themes about growing up, the parent/child relationship, and large animals that are basically cats. Sure Pixar mauls DreamWorks in a head-to-head animation battle, but it’s the story that matters and Dragon’s is better. That said, there’s still a ton to like about Brave. The most impressive part is the total confidence with which the movie simply doesn’t resolve the “who will marry Merida” question.5 It’s a Big Deal that a major film, about a princess, feels OK with her not ending up hitched to Prince Charming (in fact Brave utterly lacks any charming princes at all). So maybe I’ve slept, well hibernated really, on Pixar lately. But, and this is huge for me, Brave has given me reason to change my mind. MAYBE. Because Scottish people are so awesome! Or maybe you’ve got an intense interest in hair physics? Or maybe you have a lovely daughter and would like to show her a movie that doesn’t end with some dopey dude swooping in to save the leading lady’s life. You’ve put up with a decade of Pixar’s manipulation and are ready to cast off the chains that bind you! There are 10 reader comments. Read them.